Cupping therapy has garnered some major social media and wellness attention in recent years. But when you think about facials, a forehead full of bruises isn’t probably what you had in mind. So what’s all the buzz around facial cupping anyway? Will it leave you looking gruesome or glowing? Here’s what cupping experts have to say. The ancient technique involves placing suction cups on the skin to help facilitate healing with improved blood flow. 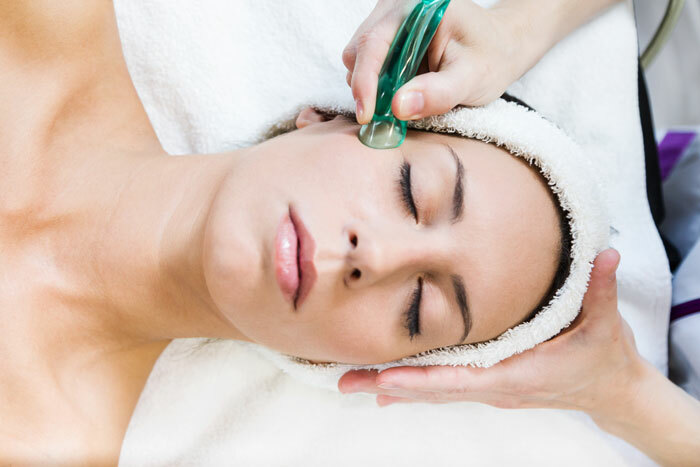 According to medical esthetician Elena Duque, facial cupping is a type of facial massage treatment used for lymphatic drainage to instantly plump up the skin and give it a glow. It may be particularly helpful for clients who desire decreased puffiness, a temporary face-lift effect, relaxation, sinus-clearing, inflammation relief, or reduced fine lines and wrinkles. Caleb Backe, a skin care expert at Maple Holistics, says, “A professional will usually begin by applying various skin care products to prepare your face and then proceed with cupping.” Unlike body cupping, facial cupping involves smaller, softer suction cups (so don’t panic!). Backe explains, “It feels like the cups are loosely grabbing your skin and moving quickly across your face and neck. [It] should feel like a soothing massage. The suction effect of cupping pulls blood into the area under the cup which promotes positive blood circulation.” According to Dr. Rabia of iCliniq, the oxygen circulation of blood under the skin encourages bright, lively skin with little risk of cupping marks. With zero downtime and an immediate plump and glow, there’s little to lose with facial cupping. As far as side effects go, “You should have slight erythema, which should subside within the hour. Another possible side effect is dizziness because you’re essentially detoxing,” explains Duque. Of course, if you try it at home, be conscious about constantly moving the cups to prevent any bruising. Duque recommends cupping for nearly everyone with the exception of those battling acne or rosacea, which could be aggravated by the suction. For the DIY-ers out there, facial cups and oil can be purchased for under $20. If you’d rather leave it to a pro, a facial cupping treatment may cost anywhere from $40 to $200 depending on spa location, length of appointment, and accompanying treatments. Ready to take your beauty game to the next, next level? This tool is every model’s best-kept beauty secret.